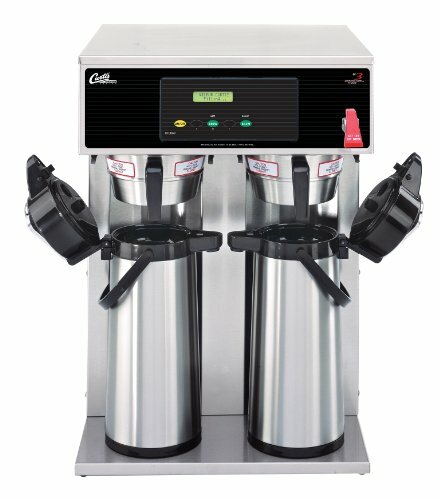 PRODUCT DETAILS: Wilbur Curtis G3 Airpot Brewer 2.2L To 2.5L Twin/Standard Airpot Coffee Brewer Dual Voltage – Commercial Airpot Coffee Brewer – D1000GT63A000 (Each). The G3 Digital Control Module provides you the expertise to brew premium gourmet coffee with ease. Portable design makes this airpot coffee brewer easy to transport. Built-In Fine Tuning Brewing Modes — Pre-infusion or pulse brew enhances extraction of gourmet coffee flavor…. Purchase Wilbur Curtis G3 Airpot Brewer 2.2L To 2.5L Twin/Standard Airpot Coffee Brewer Dual Voltage – Commercial Airpot Coffee Brewer – D1000GT63A000 (Each) at Discounted Prices ✓ FREE DELIVERY possible on eligible purchases.